Modernista balconies are authentic Barcelona hallmarks. 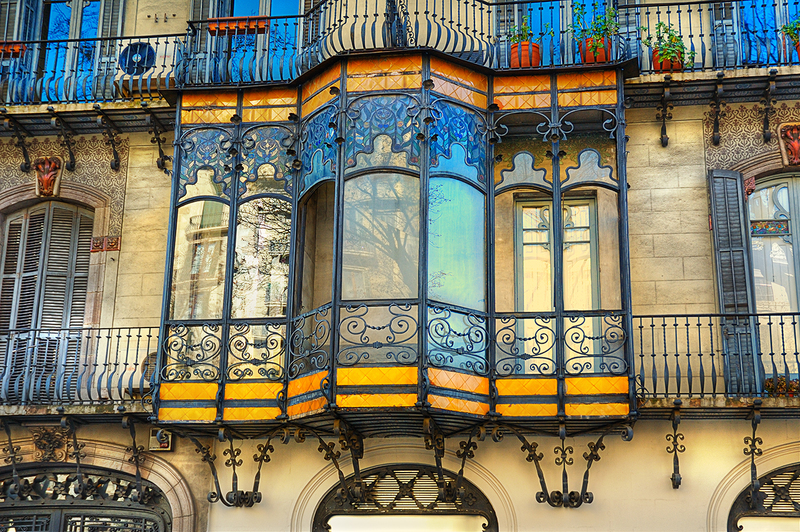 Catalan Art Nouveau is everywhere, in every detail and displayed in full splendor. Gran Via de les Corts Catalanes, one of our main arteries holds very good samples of this art such as this apartment building at number 658. The place you see here is a restoration made in 1900-1901. The original house dates back to 1871 and had been designed by Eduard Fontseré. The reform was carried out by architect Pau Salvat i Espasa (1872-1923) later on. Notice the magnificent ironwork especially on the tribune and the leaded glass panels. wowowow Carlos! that is so beautiful to behold! i love coming to your photoblog. Barcelona is such a beautiful city. What a fabulous building. Great colour and magnificient scroll work. Perfect example of how to add to an existing building and make it even more beautiful. We seem to have lost the ability to do that today. That is absolutely beautiful. I'm glad I found this blog! The ironwork and balcony details are well beyond magnificent! It must be very, very expensive real estate, non?